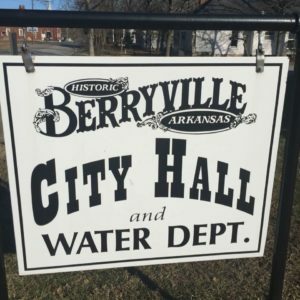 Welcome to the Berryville Water and Sewer System. We look forward to serving you! Hopefully, you will find the following information useful. If your particular question remains unanswered, please feel free to give us a call at 870-423-2245. To begin new service, it is best that you come into our office. There is a customer identification form to fill out and information to be handed out to you. 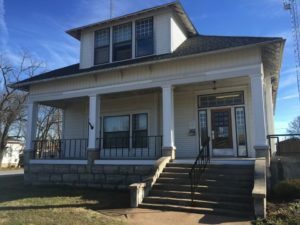 We are located at 305 E. Madison, which is 2 blocks east of the Berryville Post Office, just off the Public Square. Please be sure to have with you the correct account location, your social security number, photo identification (we will need to make a copy of it) and a check or cash for the $75.00 deposit. We do not accept debit or credit cards. You can print off your own customer identification form by clicking here. If you are starting service at a rental, you must pay the required $75.00 meter deposit. We do not waive deposits on rentals or business accounts. Also, the entire deposit must be paid before service can be turned on. This deposit will be refunded to you once you no longer use the service and your final bill has been paid in full. If you own the home for which you need service, you may be able to avoid paying the meter deposit if you can provide a letter of good credit from another utility company. Visit our policy and procedures page for further information. Please make all arrangements necessary to begin service at least one day prior to the date you need service started. The Water Department does not provide same-day service. Also, please take extra care to be sure that all faucets are turned off inside the home or apartment. The Water Department will not be held responsible for flooding. Please, too, look around for a recycling bin which has been provided by the city. These are City property and are to be left behind when residences are vacated. Apartment tenants will not have a recycle bin. Visit our sanitation page for further information. We only accept cash, checks, and money orders for payments made in the office at this time. We do offer automatic bank draft, where we draft your bill out of your checking account on the 5th day of each month. In order to sign up for this free service, just click on this Microsoft Word Document Bank Draft Form, or download the Bank Draft Form in PDF format, fill it out, and return to us. In order to get it set up to draft for the current month, we must have it in our office by the 1st of the month. We have also recently added the ability to pay by debit/credit card online or by calling a toll free number. SOFTtelPay will charge a nominal fee for using this service. To pay online click here or to pay over the phone call toll-free 855-483-5729. When you are asked to enter an identification code, use 7261611. You must have your credit card and your bill in order to enter other needed information. We have also added the ability to receive your monthly bill by email instead of postal mail. To sign up for this, please visit berryville.viewmybill.net. You will need your bill in order to enter needed information and you can also opt to pay by credit/debit card from that site as well.